Dr. E. Ignatius Jacob co-founded JH Rehabilitation with a mission to empower patients with the ability to live their life independently to the fullest. He received his MBBS from Sri Ramachandra Medical College and Research Institute in 2011 and his M.D. in Physical Medicine and Rehabilitation from St Johns National Academy of Health Sciences, Bengaluru in 2017 eventually becoming a Senior Resident Doctor at the St Johns Hospital till early 2018. During his residency, he was able to provide superior care and treatment that enabled many to lead an independent life. 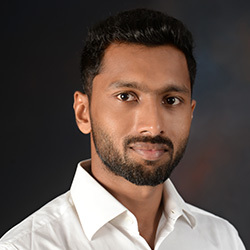 As a Physiatrist, Dr.Jacob uses a Trans-disciplinary approach to treat a broad spectrum of disabling medical conditions like spinal cord injury, brain injury, polytrauma, amputations, musculoskeletal and sports injury, cardiac, pulmonary, pediatric and geriatric conditions apart from using medications and injections. He has made several paper presentations in state and national conferences. Besides medical practice, he is a fitness and sports enthusiast and a tennis player helping many to achieve fitness and competitive sports goals. ©Copyright 2019 JH Rehabilitation. All Rights Reserved.